NOW AVAILABLE ON KINDLE THROUGH AMAZON.COM!! In 1974, Lou Falconi, an idealistic 27-year-old, uproots his wife and family from the security of middle-class America to become headmaster of a small oil company school in Dubai, a desolate oil community in the volatile Middle East. Lou soon meets Tim Johnson, an eccentric ex-oilman known as “The Duke,” who initiates Lou to a world of power and wealth. Intoxicated by the inexhaustible riches of the oil-rich Shaikhdom and the powerful people around him, Lou eagerly follows the Duke on a journey in search of fortune. During this rite of passage, Lou confronts heavily-armed Iranian patrol boats, Yemeni extremists, Arab Jinns (spirits), a likable but ruthless gun-smuggling Bedou (nomad), and finally, a complex scheme by the Duke to obtain immortality. The internal moral struggle, brought about by Lou’s personal quest for wealth and the mystical magnetism of the Duke, tests Lou’s virtue, loyalty and love. 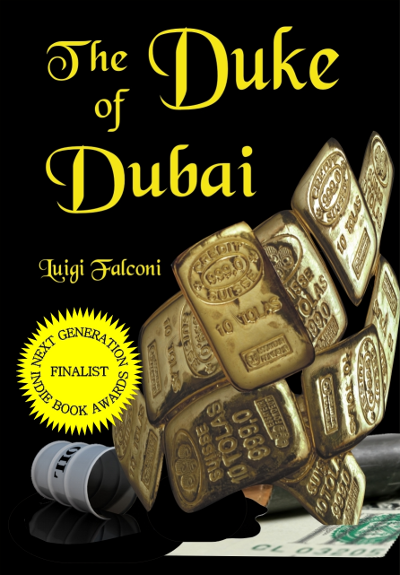 (Terra Alta)—The Indie Book Awards has named The Duke of Dubai by Luigi Falconi one of the top multicultural novels of the year. This award winning book has enthralled readers since its release and ironically, was recently banned from sale in Dubai by the censors for the United Arab Emirates. Needless to say—everyone is wondering what the story is! The Next Generation Indie Book Awards is one of the most prestigious book awards for independent publishers and authors worldwide and was established to recognize and honor the most exceptional independently published books in 70 different categories and is presented by Independent Book Publishing Professionals Group in cooperation with Marilyn Allen of Allen O'Shea Literary Agency. All books are judged for their content. The judges include expert editors, writers and publishers in the book publishing industry. The Budweiser Bedouin? I still belly-laugh when visualizing the bandoleered Abdul wearing an “I HAD A CLIMAX AT ROCKY’S PLACE” t-shirt over his dishdashah. Luigi can tell a tale— and there are plenty of them to be told. Luigi’s stories are all fiction. When my book is published the real truth of Dubai’s past will be told. Fiction! I did business in Dubai in the early 70s and I’m sure I met some of the characters in this book. Didn’t I?